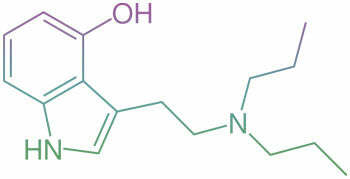 4-HO-DPT is the chemical abbreviation for the research chemical 4-hydroxy-N,N-dipropyltryptamine. It is considered a psychedelic tryptamine that is relatively unknown. This novel compound has been reported to have similar to the more known chemical; DPT. If you are choosing to buy a research chemical such as this one then you must be aware of the legality of said chemical within your home country. Not doing so may result in prosecution and most likely would not be favorable to your well-being. 4-HO-DPT is not for human consumption and should be handled with extreme caution. When handling research chemicals be sure to use gloves and goggles to avoid any bodily contact. To store your 4-HO-DPT for future analysis it is recommended to keep it out of direct sunlight and in a cold and dry area.